Mayor John McNally, Sharon Letson, Executive Director of Youngstown CityScape, and Youngstown State University President Jim Tressel joined with other partners, funders, stakeholders and the community to break ground today on the Wick Avenue Improvement Project. 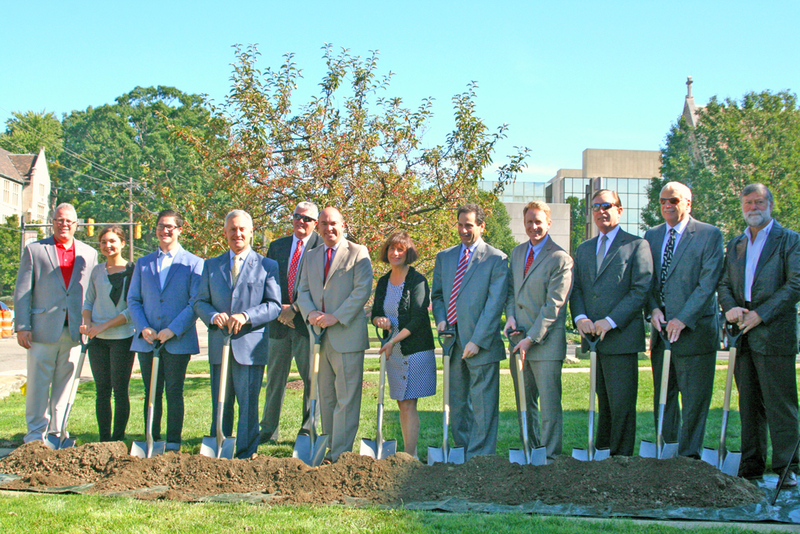 Groundbreaking ceremonies took place on the Wick Avenue lawn of the Public Library of Youngstown and Mahoning County at the corner of Wick Avenue and Rayen Avenue. The groundbreaking marks the start of the city’s roadway resurfacing and reconfiguration project and the simultaneous work on re-imaging the look and feel of Wick Avenue with new lighting and the burial of utility lines being undertaken by partners and stakeholders along Wick Avenue as a concurrent project. CityScape Executive Director Sharon Letson provided an overview on the design aspects of the project. CityScape, the City, YSU and the stakeholders along Wick Avenue, including the Public Library of Youngstown and Mahoning County, the Butler Institute of American Art, St John’s Episcopal Church and the Mahoning Valley Historical Society, have focused on the burial of utility lines and improvement of pedestrian and traffic lighting, important components of the Wick Avenue upgrade project not covered by the City’s federally funded roadway reconfiguration and resurfacing project. CT Consultants provided the engineering for the utility line/lighting portion of the project, and MS Consultants served as the City’s consultant on the roadway reconfiguration. Marucci & Gaffney Excavating successfully bid the work, which is scheduled to be completed in the spring of 2017.